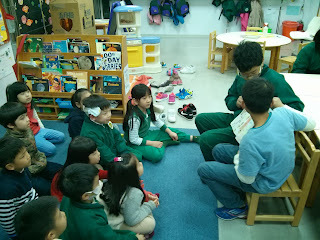 If you recall, in January the class's assignment was to work with a partner to write, illustrate, and publish an original children's book to be read to the ASLA Kindergarten class. The class worked very hard and finished two excellent books. I have taught many Grade 6 classes at Happy Kids that have done this assignment, but this is probably the best set of books I have ever received. I couldn't be more proud. I hope you are too. Melody and Sabrina wrote I Want a Shell. It is a story about being happy about who you are. In it, the main character, Mr. Noshell, sees all of his friends have shells, and he wants one too. He searches and searches for one, but always comes across danger. In the end he realizes that he is happy after all, just being himself. Jacob and Austin wrote The Race to be the King. This story tells of a Pig King who needs an heir to his kingdom. He announces a race where the winner would be crowned prince. Three pigs volunteer, each with their own flaws: a glutton, a vain pig, and kind pig who is not too fast. The pigs race, but in the end, just like in Tortoise and the Hare, it is the good pig who stayed at it who wins. It is a funny story with a great lesson. The children will bring home a copy of each book when Happy Kids gets them made. Can't wait for you all to see them.